Samsung Stainless Steel French Door Refrigerator – Model RF4287HARS 28 Cu. Ft.
Are you tired of having to go to the grocery store and clean out your refrigerator to make room for the new ingredients? You might spill something and it drips from shelf to shelf all the way to the bottom creating a bigger mess for you to clean while your groceries wait helplessly on the table while you make room. After everything is finally inside the refrigerator, you close the door, look around and the refrigerator doesn’t match the kitchen, but instead is an eyesore to the feel of your home. Even worse, on a hot day, you have to dig through the freezer to find ice trays or move around items to scrape the bottom of the tray to keep your nice sweet tea fresh while you enjoy a relaxing moment on the deck with the suns’ rays on your arms and legs. 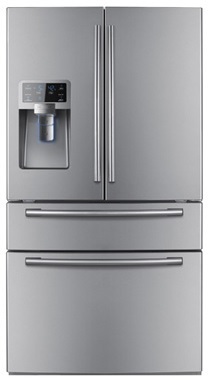 It’s time to make a change- out with old and in with the new Samsung Stainless Steel French Door Refrigerator. 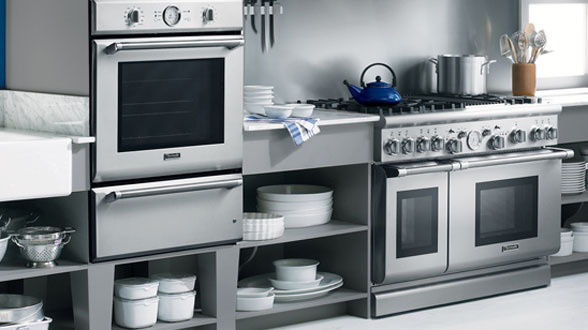 This appliance will increase the aesthetic appeal of your kitchen times ten, with a beautiful modern look, that will make your old refrigerator look a hundred years old by comparison. The Samsung Stainless Steel Refrigerator model, RF4287HARS, is definitely the answer to the new stunning look of your kitchen as well as the amount of room and flexibility you and your family desire. This 28 Cu. Ft. appliance is Energy Star efficient, reducing monthly electricity costs while maintaining the freshness of all your ingredients. The model includes a filtered in-door water/ice dispenser with sculpted handles and a French door, with a counter-depth allowing for ample room to hold food for even the largest of families. 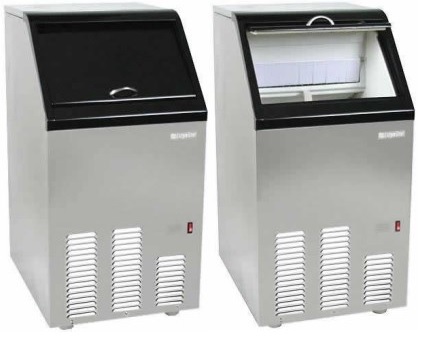 Specific features include a twin cooling plus system, five spill proof tempered glass shelves, a wine rack, a special FlexZone drawer with four specific temperatures for additional storage and granting optimum usage foods that may require special temperatures, an open door alarm, foldable shelving, six pockets to hold an array of items including two gallon-sized jugs, and a large freezer space. These combined features offer the best possible refrigerator, one can imagine in a kitchen that may also come in the colors: black and white. 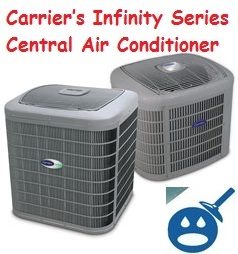 If there are bubbling sounds coming out of the newly installed refrigerator, it can be ignored as it is normal sound caused by refrigerant gas that is moving through the pope in the unit, as it cools or freezes the food inside. Other symptoms like cracking or popping noises are very normal sounds as well, and it doesn’t require a service. Those are usually caused by the temperature changes which make the plastic expand and contract over the time. It could happen due to either frequent door opening activities or when it goes into automatic defrost mode. Sometimes it happens when the ice harvest activity is going on, and no further action is required to that specific noise. 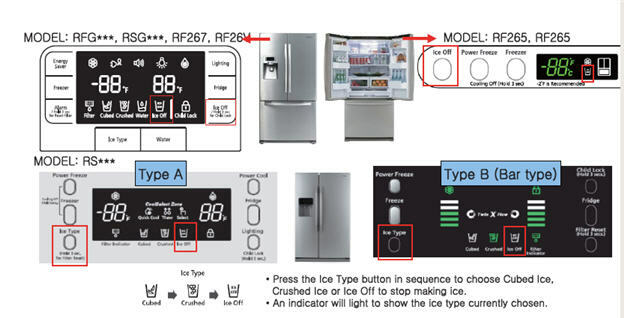 As a note, it is suggested by the manufacturer that you turn on the energy saver function, as when the function is off, then there will be heating coils inside the refrigerator doors which are designed to remove the condensation from the doors.